Brian Hershey was eating at C.R. Buck restaurant in Pennsylvania when his wife Lyn interrupted his next bite with a scream. She saw something wrong, or maybe something right, about the potato chip in his fingers- it looks as though it is a replica of one the popular portraits of Jesus by Werner Sallman hung in Sunday school classes across our country. Though they don't normally look for Jesus in their meals it was hard for them to ignore this deep fried slice of potato. 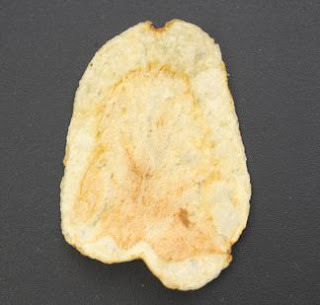 They think this crisp may have some spiritual meaning. “We both just accepted Jesus in the last six months, so I think it’s a sign that we’re doing the right thing,” Lyn said in an interview with her local paper. “We were talking about quitting smoking when we found the chip, so the kids think that’s what it means,” Lyn says. The family keeps the Jesus chip in a foam dish with a clear plastic lid for viewing next to a photo of Lyn's mother, who died 17 years ago. They have no intention of eating it the morsel although it would be an interesting way to celebrate communion.